Quick a number from 1-12, which song artist to hear, which song, which short story chapter to read, luv it. It’s fun to use and takes away several situations faced with trifle decision. 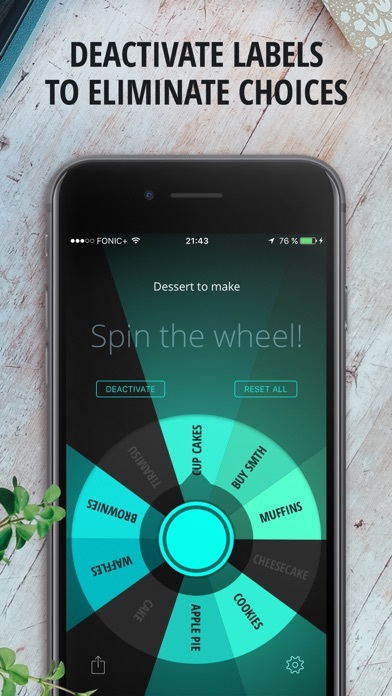 Sick of the hum drum chore list then make a wheel and spin the random order up of chores. Rids monotony and dull pattern plans by random selection. The wheel idea is the retro modern way to gather and list things. Great job! This is a great app. Live by it. Love that I can make my own decision wheels. 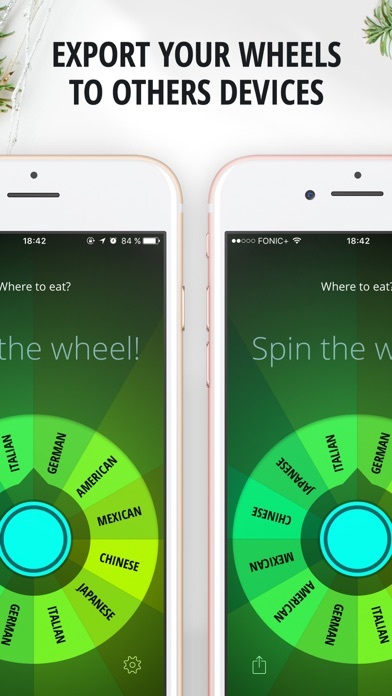 I finally found and app that can just pick as we spin the wheel. Instead of doing the old school style by picking it yourself. GREAT! For raffle prizes, just enter the numbers and let the wheel pick for you. Great app. Pretty clean interface. When deactivating an option on the wheel, it would be nice to have it remove the pie piece from the wheel so when it spins again it doesn’t land on a large grayed out spot and auto select what it’s closest to. It could instead spin one or two more spots depending on how many options are left. This is the best currently in the App Store! Only things I wish were possible: more adjustability to the speed, and the ability to change the sound effect with options! Otherwise a flawless app, for what it is intended for! helps a lot with my life love it so much!!! For a while now I’ve been looking for an app to help me randomly make decisions.. whether it’s flipping a coin, rolling a D20, deciding which movie to see, or where to eat tonight, Decide Now! has me covered. Creating, editing, and using a wheel is very easy—and satisfying. Not to mention, the entire app is really aesthetically pleasing. Thank you for this awesome random tool! Though the better version is locked behind a paywall, it is still cheap and affordable compared i some other apps. This app is different from other apps in that... it actually works! 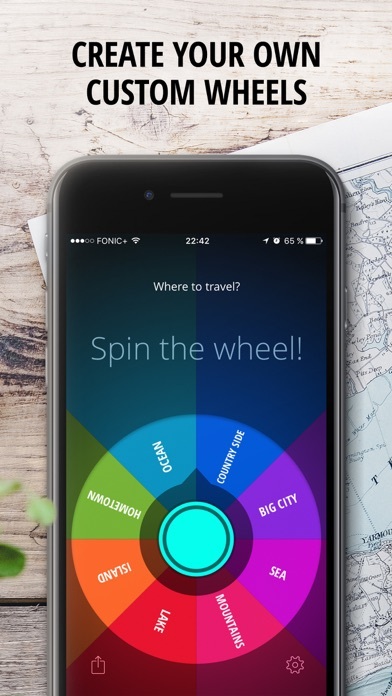 The spin is satisfying and the amount of categories and decisions you can add is phenomenal, I recommend this app to anyone who wants a wheel spinner. It’s a great app, but why no sound? I love this app, it’s great for what I need at vendor shows but why no sound? I bought this in hopes of having the clicking sound to help draw others in to spin the wheel for prizes and such. Help! You must listen to the spinner. If you don’t heed the law of the spinner, you’re gonna have a bad time. I like to use the spinner for d&d mechanics among many other applications such as deciding which movie/show to watch. The spinner is law. I do a best 2/3 and if I don’t listen to the spinner, things often don’t go my way. You can use it to decide where you’re going for fortnite! Just put the labels as Locations in fortnite and spin the wheel. Works great! I don’t mind the dev changing the look, but why not let me have the old look as a choice? Is it to make the app size smaller? Can you bring back the old style as a choice at least? The plastic look of the middle spin button also, I think I remember having something else that I’m missing. I just can’t put my finger on it... if I can get the old style back, I’ll give it 5⭐️ . I use Decide Now! to tell my viewers to have a (positive adjective) day when I'm ending videos. I've used this app for the same purpose at the end of my class periods, and my students are eager to see what word will be chosen by the spinning wheel. This is a good app that can help students decide what to study first or last, especially for midterm and final exams. I LOVE THIS APP SO MUCH!!!!! This app is correctly titled. If one has to make a choice 2 things that are equal in every way — this is your app! 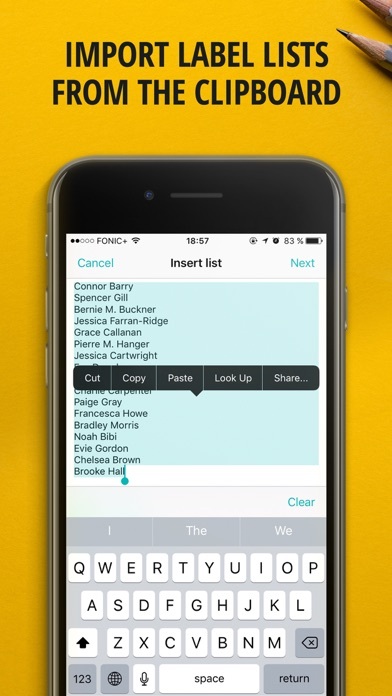 Save time digging for a coin to flip; just tap and decide! Great app. I love it and use it a lot in my class. But what happened to the sound?? I need the sound! Does what it says on the tin. Nicely implemented graphics and UI - feels very polished. Haven’t run into a list limit yet. More or custom color schemes would be nice. I’m using this for fun (Magic 8 Ball responses!) and to encourage me to use all items in a collection I have, rather than continually going back to the same things. THE BEST! I LOVE IT!!!! So easy and fun! A fun way for the kids to pick a chore!! No fighting no hassle because it picks for them, all they need to do is spin the wheel!! Love that I can add what I want the category and the answers to be!! THE BEST ONE!!!! Great great great. Wish it had a function that made the things you input random. So, if I created labels entitled 1,2,3,4, they would appear on the wheel in random order. This app is a fun way of deciding what to do! Try it! Sound is not working on the app. Is anyone else is facing the same problem,? The ability to take the pressure from deciding which place to have dinner or which direction for a random walk makes this a front page (screen) app because I use it everyday. I enjoy setting up the wheels and then anticipating where the wheel will land. Boring decisions are now a game. I've recently come back to this app and love the visual improvements and the new "Deactivate" feature. I'd recommend this app to anyone looking for a fun way to make routine decisions. For future improvements, I'd like it if there was a way to deactivate wheel segments before spinning. For example, if I'm deciding what to make for dinner but know I don't have the ingredients for lasagna, it does me no good to have to wait until I've landed on "lasagna" before I can deactivate it. I feel like editing and selecting wheels could be a step or two less to navigate the app. Custom color schemes would also be nice as I don't much care for the available choices. I use this when i want to exercise in the morning, i put about 8 different workouts, and after i do it i deactivate it! Then at the beginning of the next week i reset! Great work! Best looking; best decider app out there. Top notch. this app is great at making random choices. it's nice to be able to deactivate choices, and randomize the items on the wheel. I was using roundum, and it was picking the same choices each time. this is not the case with this app. I also like that it's fully customizable. I needed an app that I could customize for a contest with several participants. It worked flawlessly. Only suggestion I would make is to have less "friction" on the spin so it takes longer....to create a little more excitement. Love this app. I would like it to have an option to eliminate a choice/ selection once chosen. Such as block that choice without deleting from wheel. Then when everyone has been selected just reset. My ESL class fears the ticking! Best classroom tool ever, keeps every student on their toes! Please please please update it so I can press a button to alphabetize or randomize the list in the edit mode. Sometimes I have so many things in my lists that I forget what's there. I want to be able to quickly scroll down the list to see if I already entered it. That would make it perfect. Deactivate function doesn’t work anymore? I used this a lot in other to let remaining players have a second round. But now ( because of an app update? )somehow the button no longer works. 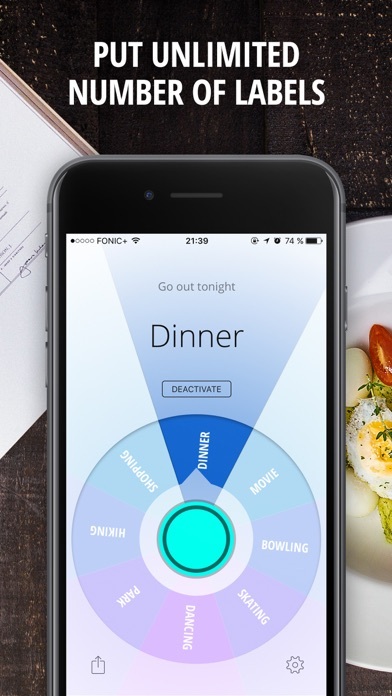 I love this app because if you have trouble deciding where your going out to eat or if someone wants to go to the park and the other person doesn’t then make a wheel and spin it. When you get this app it comes with wheels already made so if you want them you can keep them or if you don’t want them you can delete them. This is a very good app and very useful. One feature that the developer might add is landscape mode for iPad. It will be great feature because then it can used in split screen view. My student absolutely love using this as rewards in the classroom. I’ve re-downloaded recently, however the sound is not working, which is a fun element of using it. This app is superb!!! Since I purchased it, I've been making different wheels from aspects of my business (I'm an artist and sometimes I needed a random subject for my artwork. It has made such a difference in my work!) to my social life (My wife and I created a wheel together. 5 of my favorite movies and 5 of her favorite movies) We love it! When one gets watched it is removed from the wheel!... Anyway... The small request is to please make the app able to be read no matter how the device is positioned. Whether it be portrait or landscape. Thanks for making this app!!! This app was visually appealing, and boy did it deliver. It had everything I needed to set up a giveaway for one of my YouTube Streams. Now I did get the full version so I can make my own wheel and use the deactivate feature. One suggestion I’d like to make is to make it possible for the wheel to stop/land on a deactivated space and have it not light up. Maybe have it as an option you can toggle on/off. Another one would be the possibility to reactivate a deactivated space. Just makes it easier if someone were to accidentally deactivate the wrong space.